What you read and hear will not only help guide you through the course but will keep you safe allowing for a better experience. 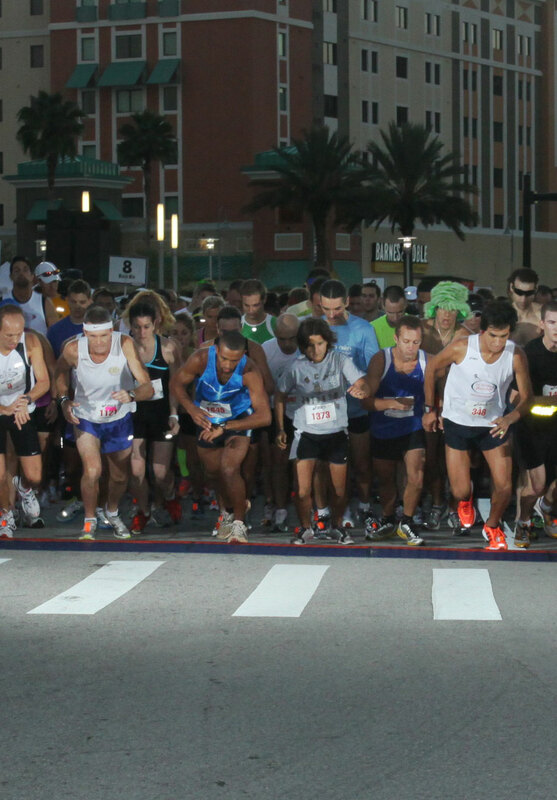 At the start of the race, you'll be excited to line up to get started. 'Lining up by pace' at Track Shack events means that you look for pace signs such as ' 6 Min Pace', '7 Min Pace', 8 Min Pace and so on. If you run a 10 minute mile pace that is about a 31 minute 5k. For new participants this is the easiest mistake to make and the easiest to get right the next time. Proper start line alignment means that the fastest get to start at their desired speed. When you see people bobbing and weaving that means slower participants lined up too close to the start line and faster participants lined up too far from the start line. In most races, only fast runners should line up near the front. Walkers and slower runners should start at the back of the pack. There is nothing wrong with this and it will allow everyone to have the best race possible. When people line up accurately according to their pace, everyone is safer and happier. You never know where the camera might be- on course, at the finish line or post race festivities. That means that when you see a couple friends and you start chatting, notice if you are creating a blockade for others to bob and weave around. Other runners will want to get by you. If you want to walk as a group, that's great! Just, please start in the back. The volunteers give their time and make races happen. Smile, wave, say "thank you", even grunt in their direction to let them know you appreciate what they are doing. Hopefully, they'll keep coming out to help, so you can keep enjoying the races. It’s okay to slow down, walk or even stop during your race. Many people are doing walk-run intervals where they walk for a set time and then run for a set time. To be considerate of those behind you, always pull to the side of the road to take breaks. When you are racing, it is easy to lose yourself in your thoughts and forget about the people around you. This leads to people being cut-off or even being tripped. Be especially aware of people around you during waterstops. It's important that you don't slow down, or start walking, directly in front of someone else who is going faster. Please make an effort to throw your cup at a trash container. If there aren't any available at the waterstops, then toss the cup with other cups. Try not to have them spread all over the course; remember, someone has to clean them up. When you cross the finish line, don't just stop to catch your breath. You actually need to continue on out of the chute area before you stop. If you stop directly after you cross the finish line, you may find yourself being run over by others trying to cross behind you.